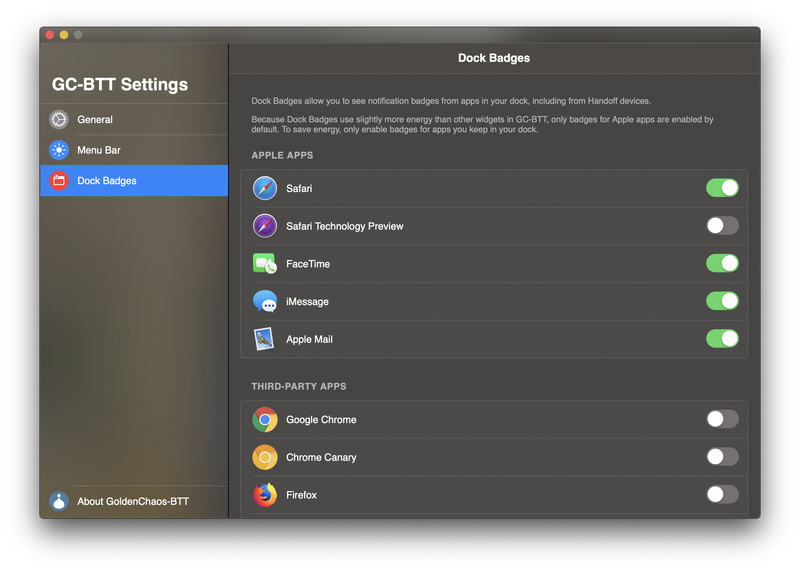 [Dock Badges] This means that dock badges actually work with handoff now!! Let me know if any of the new dock badges fail to click their dock icons! I wasn't able to test all of them. This version is massive. It contains the "true" settings implementation, a full refactor with persistent variables and a master script to check and reapply all settings. The end result of all of this is that upgrades should finally be totally seamless, with no loss of settings provided you configured GC-BTT using the built-in settings panel. Additionally, presets have been completely rebuilt to use this new system. All you have to do is set the persistent variables to your liking, then run the "Check All Settings" trigger. This means that presets can be contained in a single AppleScript now, too - check out the example below. If you've been holding out on trying experimental versions because you didn't want to lose your settings, this is the version to try. [Settings] Added "Reapply All Settings" button; tap this after you upgrade to restore your settings from a previous version! 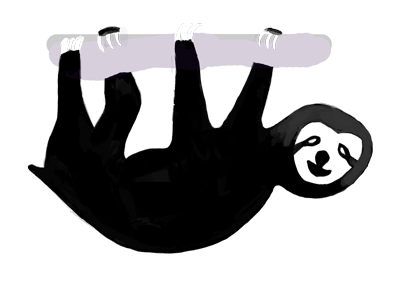 [bananas] huge shout-out to @oldgreydog, whose initial refactor of the Date/Time settings pretty much single-handedly led to the solution for seamless upgrades. amazing work! Import this version and attempt to restore your settings by tapping "Reapply All Settings" in the GC-BTT Settings menu. Wait for the loading message to disappear (it's pretty slow, so give it a minute), then close GC-BTT Settings to confirm that your settings were reapplied successfully. Report back with results, please! This is the default preset in the new version. It sets the desired persistent variables and then calls the "Check All Settings" named trigger. GC-BTT 2.639-3 introduced expanded scripting support and a massively streamlined preset format that's easy to duplicate and customize yourself. This is an incredibly powerful way to make GC-BTT bend to your will and do things I never intended it to (in a good way). Please try it out! A new stable version of GC-BTT arrives like the sun rises... once a month. GC-BTT 2.641 represents an absolutely massive leap forward for the preset. There's so much to unpack, but the biggest have to be seamless upgrading and the sparkly new settings menu. Once you upgrade, any settings you change will be preserved for future releases! There's also a really cool new connectivity actions widget with headphone connection buttons and an Airplane Mode toggle. Tap and hold on Volume Up to get to it. Finally, this version is also even more energy efficient than GC-BTT 2.600, ditching the custom Now Playing widget in favor of the newer native implementation. It also trims out extraneous scripts, and there are additional optimizations all over the place. Almost every script has been completely rewritten. 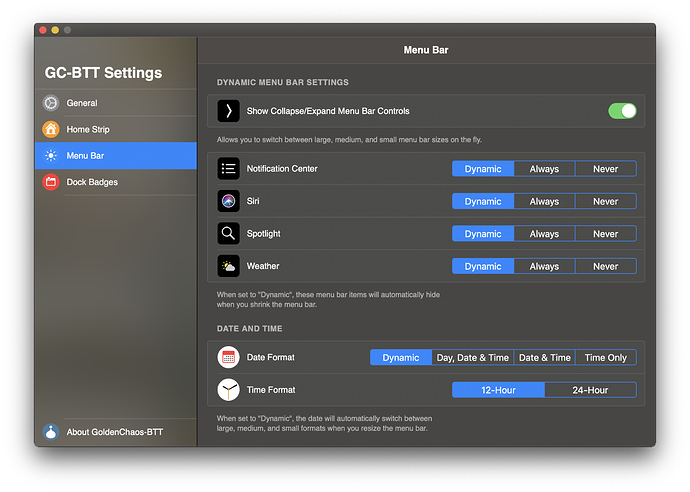 The result is the most flexible and functional GC-BTT - and, I think, the Touch Bar - has ever been, and sets the stage for expanded app support in the versions to come. A huge thank you to everyone who installed and tested the experimental versions. You made this release amazing. If you think it can't get any better than this... hold on to your butts. Full changelog below. Enjoy the release, everyone! This changelog contains all changes made since the previous stable version, 2.600. 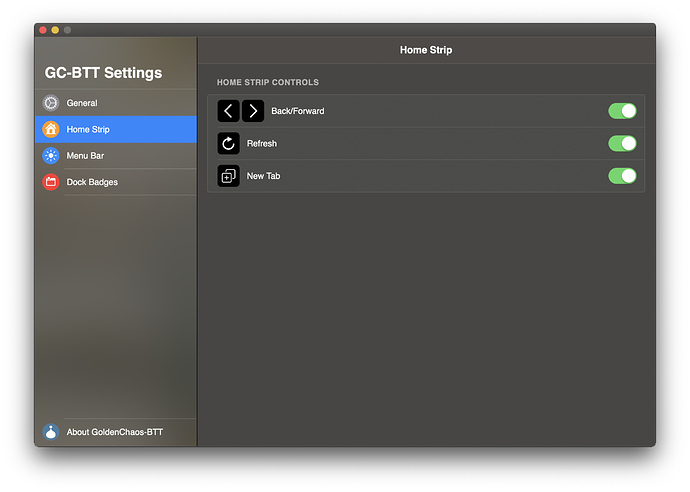 [Helper Apps] No longer requires High Sierra Media Key Enabler! Uninstall it, you won't miss it. 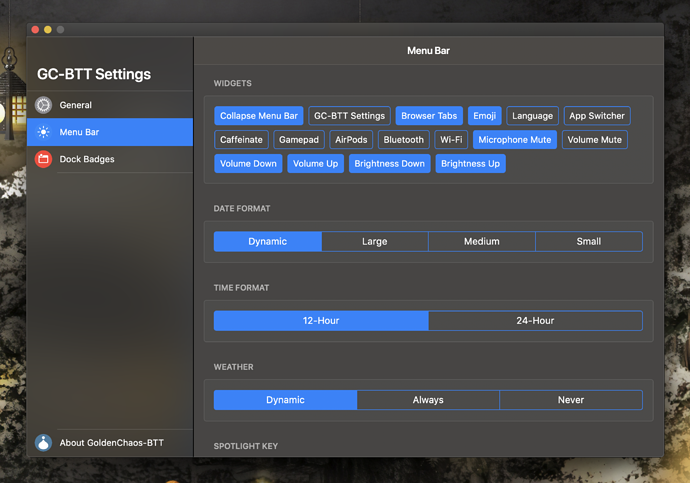 You can even disable the primary menu bar widgets, and they'll still show up when you hold Option. 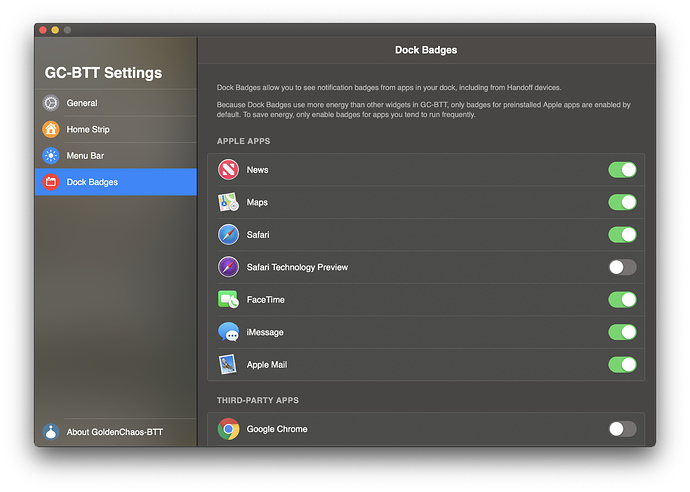 Make sure to enable only the dock badges you need, since these cost more energy than other widgets. GC-BTT Presets! Presets are collections of settings that can be applied all at once. 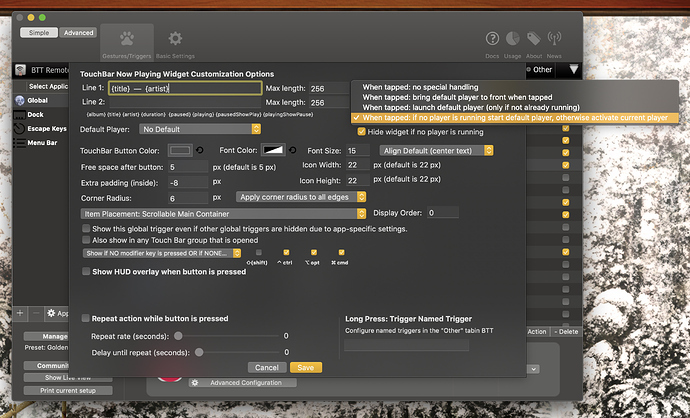 Fully scriptable: You can use presets in combination with the new named setting triggers to make GC-BTT bend to your will. GC-BTT 2.641 introduces expanded scripting support and a massively streamlined preset format that's easy to duplicate and customize yourself. This is an incredibly powerful way to make GC-BTT bend to your will and do things I never intended it to (in a good way). Please try it out! More screenshots coming later today - wanted to get this out as soon as I could! Now that I'm all moved in and settled down at my new job, I've finally had time to get back to developing GC-BTT. The next stable release is all about an improved settings menu and initial app support, starting with Photoshop. I've spent a lot of time thinking about how I want to handle switching into and out of third party app controls, and I think I've nailed it (on paper, at least). This first experimental release is just getting things going again - nothing too "experimental" just yet, so I expect it to be actually quite stable. However, the next few experimental releases will likely be substantially less stable, so you have been warned! Completely remove your existing installation of GC-BTT. Your settings are stored inside BTT, so you won't lose them. Install this alpha version from the link below. 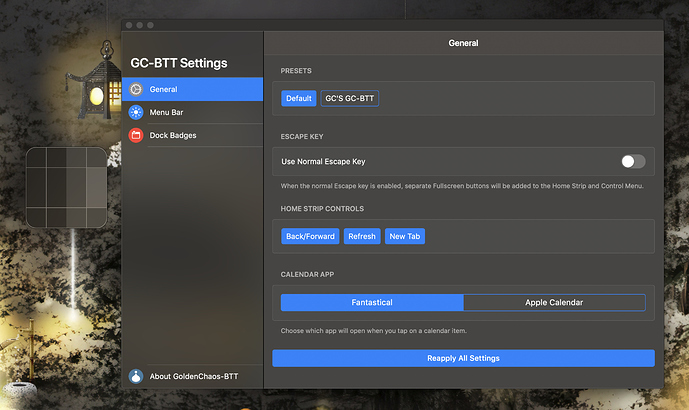 Open the GC-BTT settings menu and tap "Reapply All Settings". New experimental version! Fixing up some things from yesterday's release, adding in a few things I forgot. New experimental version! This one is actually experimental - I need feedback! This update introduces a conditional activation group that will boot you back to the stock Touch Bar only if it thinks that the autofill/autocomplete interface is being shown. I'm not 100% certain if I have the correct selection parameters, but it's a start - and it only works inside Apple's own apps, for now. 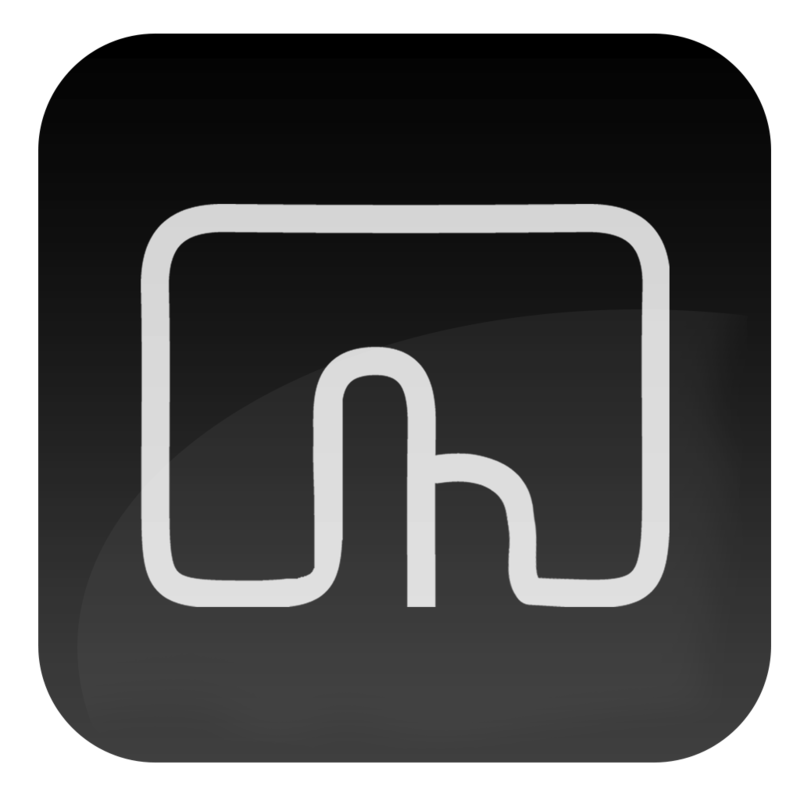 This gives you instant access to autocomplete and autofill, as well as the stock emoji picker, three of the only redeeming parts of the standard Touch Bar. As soon as you deselect the text field, GC-BTT comes right back. 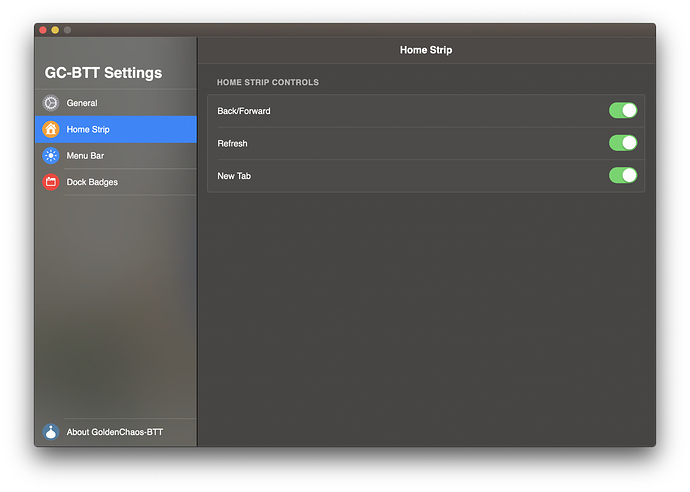 I've found that disabling Apple's Control Strip entirely provides a better experience. 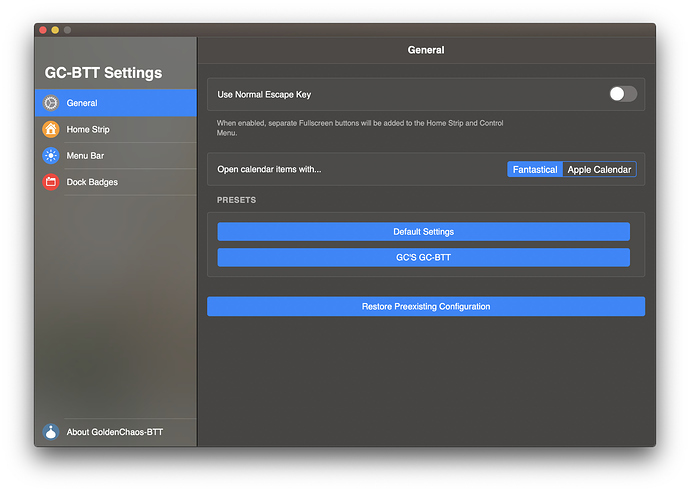 This theoretically gives access to autocomplete, autofill, and the emoji picker from the stock Touch Bar without completely compromising the GC-BTT experience and will need a lot of refinement. I honestly don't recommend anyone install this, except @Andreas_Hegenberg maybe for troubleshooting . It's a work-in-progress refactor of the menu bar and dock using conditional activation groups so there don't need to be eight copies of the same widget. It's very fast and uses much less energy. But it's also very buggy and breaks the modifier menu layouts. [Autocomplete] Removed autocomplete conditional group for now because the feature was too unreliable. Significantly faster and more efficient, but does not currently work properly with modifier menus. 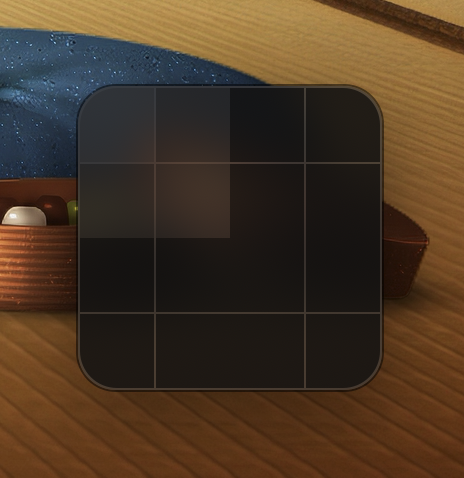 The dock didn't really have this problem but this lets me better control when and how it appears. That is, when it works properly. Which it doesn't all the time. This happens because the secondary menu bar items don't know to hide for modifier menus. The menu bar also will probably disappear after a little while. There's also no way to leave widget groups like Browser Tabs, Language Picker, etc. once you're in them, because the menu bar does not yet include toggle switches for those groups. But it's very fast!! Zooooooom. New experimental version! It's only slightly less broken than the last one. You could install this and not have a terrible time, I guess. [Window Snapping] Added visual window snapper - hold CMD+Shift+W to activate! It's missing some additional hover states for the center, top, left, bottom, and right blocks. [Escape Keys] Made esc also close any currently open widget group since toggles aren't working right now. Might actually keep this behavior, I like it! This version introduces the floating HTML settings window. It does away with the on-Touch Bar settings menu entirely in favor of this much more intuitive windowed menu. However, it's only half-implemented. All of the buttons actually trigger their respective actions (except for some dock badges, oops), but there are no indicators that processes are running, and the switches don't reflect real settings (the active/inactive buttons are hardcoded right now). You should be able to use Reapply All Settings here to upgrade, even if the progress bar is broken at the moment. Please also try toggling various settings to see if they actually do anything - results have been spotty on my end for anything that isn't reapplying all settings. [Settings] All boolean settings triggers have now been refactored into toggle scripts, reducing the number of necessary named triggers by nearly a third! Coincidentally, dock icon settings should actually work now. New experimental version! Just some bug fixes for this one. [Connectivity Actions] Volume percent will now hide instead of displaying "missing value"
The corresponding version of BetterTouchTool contains a critical fix for users performing initial BTT setups where previously button labels would show up for every widget. To prevent this issue please make sure you are on BTT 2.698 for this and future builds of GC-BTT! Two updates in one day - it's been a while! 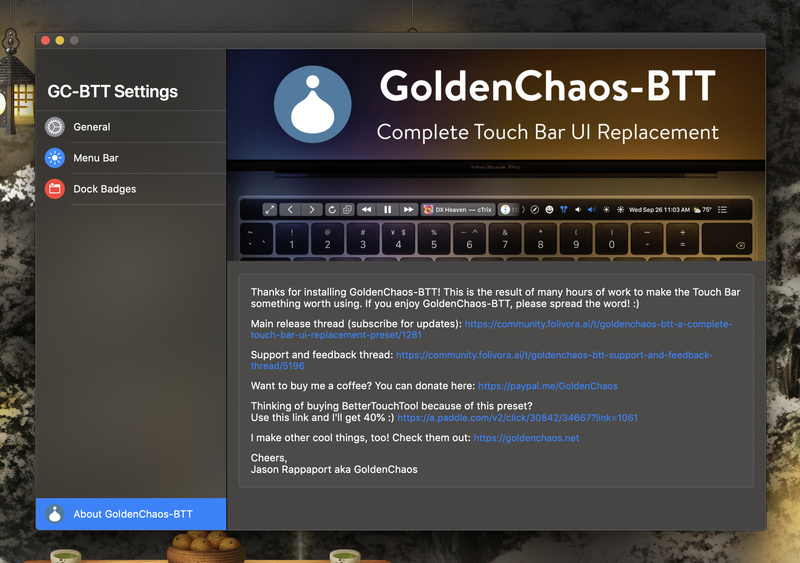 This build requires BTT 2.700 as it uses new functionality to detect which widget group is currently open. Menu bar tabs are back babbyyyyyyy! You can still use esc to close the groups if you want, though. New experimental version! Critical bug fix for the now playing widget. 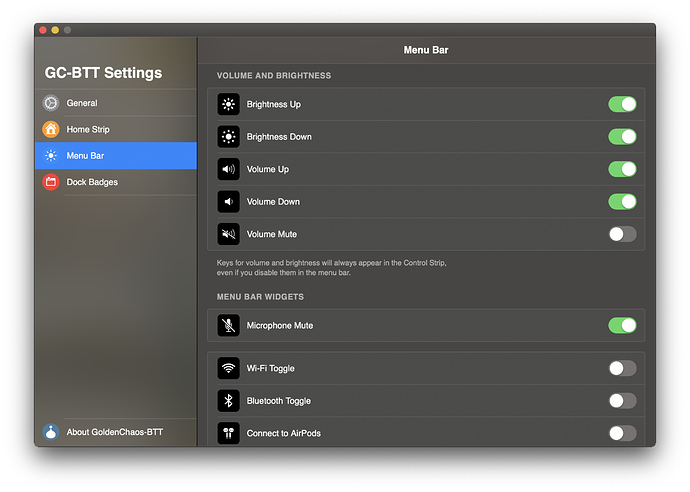 Settings window switches are up next. A new stable version is right around the corner. If you're willing to put up with the setting switches not updating yet, I recommend upgrading to this version. If not, the fix is a pretty simple configuration change to the two instances of the Now Playing widget. Open the BTT Preferences window and go to the Touch Bar tab. Make sure "Global" is selected on the left. Locate the two Now Playing widgets. One is in the Home Strip, the other is inside the Now Playing Actions group. New experimental version! The settings window really works now! At least a decent portion of it does. All dock badge toggles and the escape key toggle will reflect their actual settings in addition to actually changing the contents of your Touch Bar. Please test these out! I'll be hooking up the rest of the switches in short order. 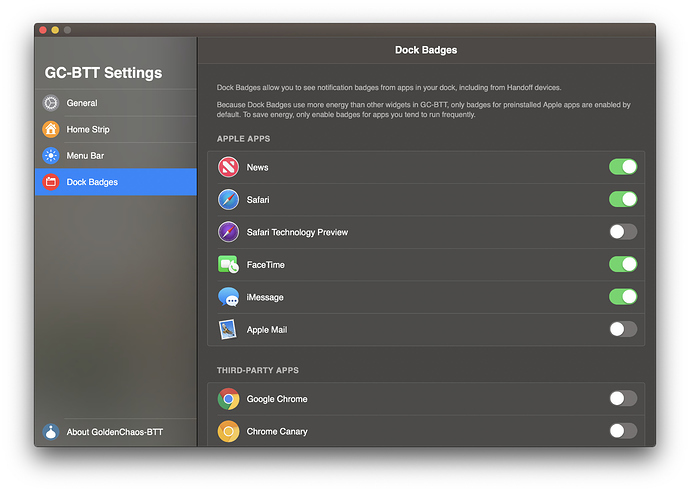 The dock badges tab is basically done, but expect the General and Menu Bar tabs to get a hefty redesign with better icons, etc before the stable release. 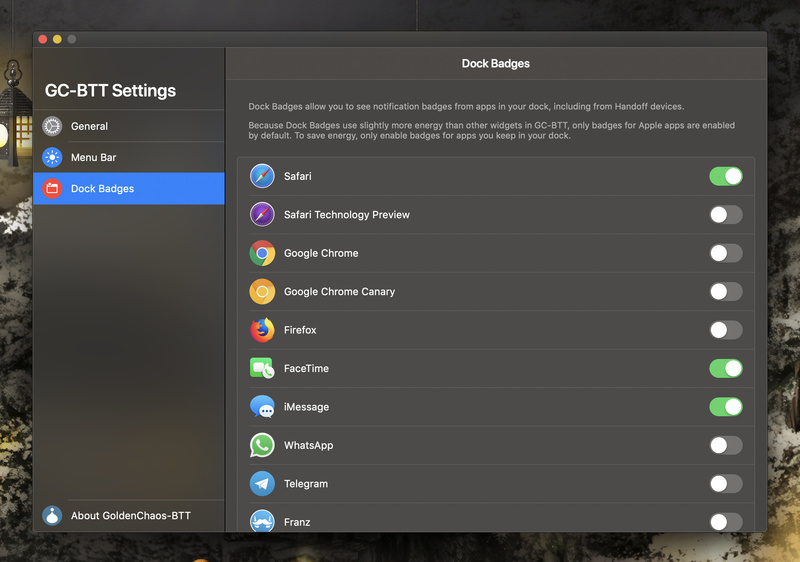 Please test all the dock badge toggle switches and make sure they work properly! New experimental version! Now most of the settings menu works! Also, I summoned all of my COURAGE and swapped the option and control menus. Let me know if you hate this. I don't make this change lightly, but it really seemed to make sense to have all the system controls under, well, the control menu. [Settings Window] "Reapply All Settings" renamed to "Restore Preexisting Configuration"
Let me know what you think of the opt/ctrl menu swap. Please test all the new toggle switches and report any that don't work as expected. Segmented controls will properly update the Touch Bar, but don't update in the settings window. That's next! I'm happy to report that the new settings window is, at last, fully functional! All segmented controls now update in real time to reflect their preferences. From here, there's just a lot of design and optimization work to be done for it to meet my standards for a stable release. This version also fixes a bug with the AirPods widget where it wouldn't open the Bluetooth menu unless the Volume menu was also enabled. This means that every switch in the settings menu is now fully functional! Hooooooly crap yes! I'm (finally) going through the current icon set and pixel-fitting them to the touch bar. A small start to something long overdue. Some graphics were updated previously, but soon every icon will be in the same 44x44 square instead of a variety of sizes, allowing you to reuse them more easily with the BTT default settings. Please test all the settings in the settings menu and let me know if any don't work as expected. You can see the new AirPods icon there. The emoji and browser tabs icons are also new, but more refinements than anything noticeable.